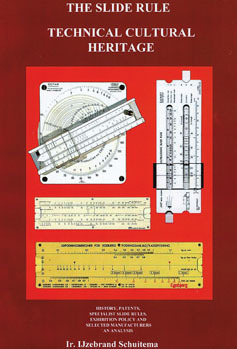 This Oughtred Society reprint of the classic The Slide Rule Technical Cultural Heritage by IJzebrand Schuitema is a must have for the serious slide rule collector or enthusiast. This book succeeds in sharing with the reader the vast knowledge and experience of the Dutch collector Schuitema from his 20-year quest for slide rules. Included are descriptions of a variety of specialty slide rules from various countries, an overview of slide rule history and patents, ideas for exhibiting, and information about three European manufacturers. Much of his collection of over 3,000 slide rules and extensive library are now on display at the Arithmeum Museum in Bonn, Germany. English, Perfect Bound, 8½" x 11", 272 pages, 30 in full color, 29 ounces. $35.00 plus shipping.